This was a fun meal. Everything was just really interesting. Yum! First the pizza. Pioneer Woman was on The View last week. She posted the clip on her blog and this pizza was featured on The View. I obviously was excited about this pizza, because I made it immediately. It is potato and leeks. But it also has some bacon and three cheeses: fresh mozzarella, goat cheese, and grated parmesan. The potatoes make it a totally different thing. Almost not pizza-y. But it is good. Also, salt the potatoes very liberally. They need it. The last thing about the pizza, I am not sure about the proportions in the recipe. The recipe is for one pizza, but I used about half of each of the toppings listed. I will keep it as she originally wrote it, but I actually used: 5 slices of bacon, 2 leeks, 2.5 baby red potatoes, 8 ounces of fresh mozzarella, and less than 2 ounces of goat cheese. As for the salad, it is very rustic and delicious. It is artichoke hearts, grapefruit, almonds, Pecorino cheese, frisée with a honey lemon dressing. I love grapefruit. I have been eating it for breakfast lately. It has been one of my faves since I was really little. The recipe also includes directions for how to prepare the artichoke hearts from whole artichokes. I definitely did not do that. It would be fun, but I just wanted a quick salad. So, I used canned. Make sure you don't use a marinated artichoke hearts. I couldn't find frisée by itself. Whole Foods told me they normally have it, but that they were out. The produce guy offered to pick through the spring mix packages for me to get just frisée. They are so nice there. I love it. That isn't the first time they have offered to do something ridiculous like that for me. I declined the offer, because there is probably 3 pieces of frisée per package and I didn't want all the trouble. I wish I could shop there for everything. All the time. And I wish I could live there and work there. Prepare the pizza crust and drizzle lightly with olive oil. Sprinkle lightly with salt. Begin by placing the bacon in a skillet over medium heat. Fry the bacon until cooked but not crisp. Remove the bacon from the pan and set aside. Pour off most of the grease. Do not clean the skillet. Return the skillet to the stove and turn the heat to medium-low. Add the leeks to the pan and sauté over medium-low heat until soft, about 3 minutes. Remove from the heat and set aside. Using a sharp knife or mandoline, slice the potatoes very thin. You’ll need to do this just before you need them, as the potatoes will brown very quickly. Arrange the potatoes in a single layer all over the crust, slightly overlapping the edges. Potatoes make a surprisingly delicious pizza topping! I was in my thirties before I discovered this. I missed out on so much! Sprinkle the potatoes lightly with salt, then lay the mozzarella slices in a single layer on top of the potatoes. I love fresh mozzarella and will drive a hundred miles to get it. Place the leeks on top of the cheese. The flavor of leeks sautéed in bacon grease is not to be believed. I usually lay on the leeks pretty thick. Next, sprinkle the fried bacon pieces over the top… Followed by a generous addition of crumbled goat cheese, grated Parmesan, and a sprinkle of freshly ground black pepper. Bake for 8 to 11 minutes, until the edges of the crust are golden brown and the cheese is melted and bubbly. Cut into wedges or squares and serve immediately. For this recipe you could buy good preserved artichokes to save time. If using fresh, whack 8 nice globe artichokes into a large pot of salted water, bring to the boil and cook for around 15 minutes (time will depend on their size), until a small knife slides easily into the base. Drain in a colander under running water for a couple of minutes and allow to cool while you segment 2 grapefruits, keeping the juice for dressing. Peel off the outer green leaves of your artichokes until you reach soft and tender yellow ones. With a sharp knife trim off the top and bottom of the artichoke, leaving you with the tender heart. Slice in half and them remove the choke from the middle using a teaspoon. Add the artichokes to the grapefruit and almonds. Make dressing. Combine lemon juice, honey, salt and pepper. Add some or the grapefruit juice if you want. Whisk while slowly streaming in olive oil. Drizzle with the honey and lemon juice dressing. Add 3 large handfuls of frisée, then toss together. Shave over some pecorino cheese, using a vegetable peeler, and serve immediately. The whole meal sounds wonderful! 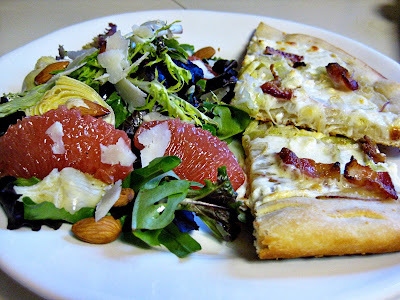 I used to work at a restaurant that served a potato leek pizza, and I remember it being delicious. And artichokes and grapfruit? yum!